Pesto? 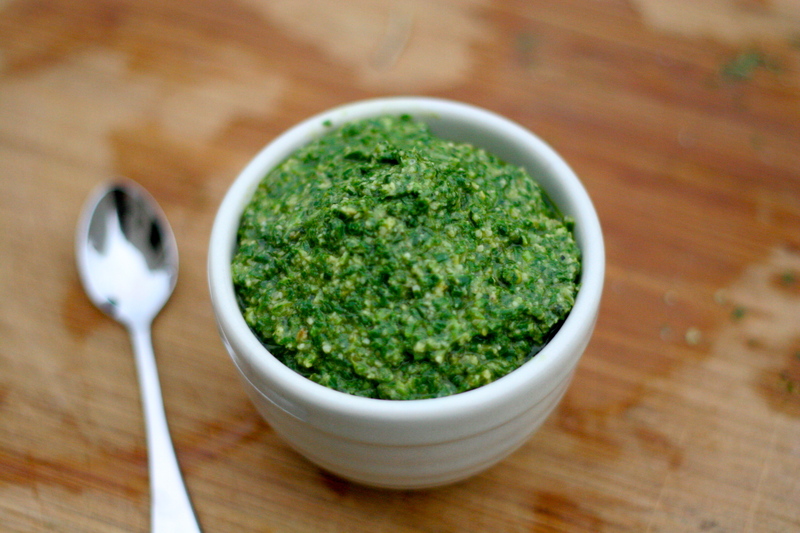 Come on, you are thinking, everyone knows how to make pesto. Yes. I know. It was one of the first dishes I ever tried to make (aside from a botched 6-year-old effort at vegetable soup with water and bouillon cubes). To make pesto poorly seems incongruous. Pine nuts, garlic, olive oil, basil, salt, and Parmigiano-Reggiano or Pecorino Romano. These are synergistic ingredients, explaining the ubiquity of some sort of pesto pasta on almost every Italian trattoria or pizzeria’s menu. I remember the first time that sister number two and I ate pesto: homemade by our Sicilian great-grandmother, by the spoonful straight from a jar in her kitchen. It is one of my earliest food memories (since they are neurologically categorized separately, right?). I also remember when sister number two came to visit me during the spring of my year in Italy and we went for a weekend trip to stay with our relatives in Piemonte. On the train ride there we twittered away excitedly about how we were going to go to our favorite local pizzeria in Ivrea to order the vibrant green paste (“pesto”) of the Gods that we had eaten there several summers prior. 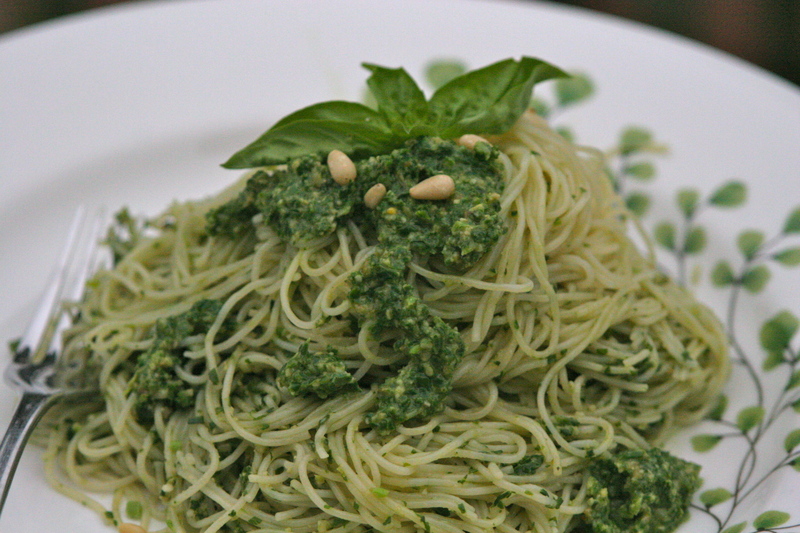 This pesto, we remembered, was nothing like that which we would get at the supermarket. The supermarket pesto smelled days old, was a dark green color and really only got us through desperate college lunches and dinners. By contrast, the Italian pesto, almost a creamy color, begged to be eaten with a scent of freshly picked basil and tasted like the legend that we rightly fashioned in our heads. We were crushed to be informed that basil was not yet in season and so they had no pesto dishes. 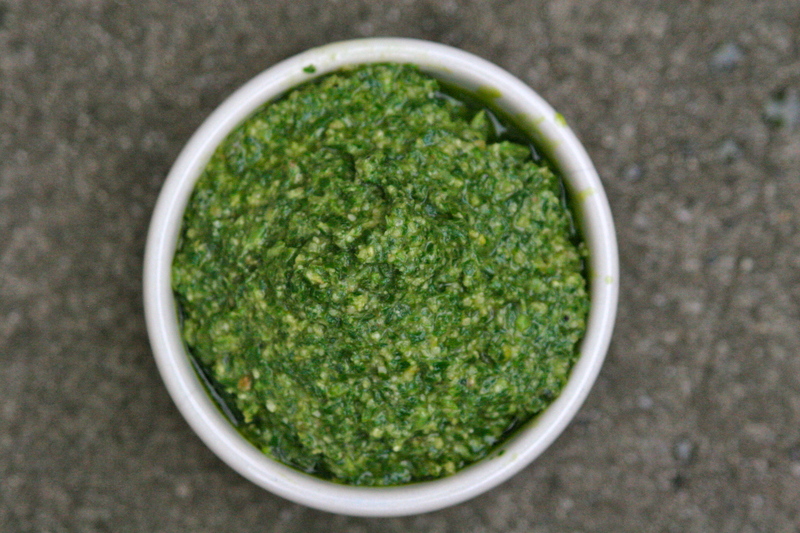 Every year for over a decade, I have made several batches of summer pesto that I store in the freezer for when the hankering hits months later, but every time I make it, that inimitable leafy green color disappears within twenty seconds of making it, no matter how much olive oil I add to prevent the oxidation that turns the pesto dark. I am in disbelief that it took me this long to realize there was one other little trick I was missing. Perhaps you are too. Did you know that most restaurants, even the fancy ones, pre-cook those gorgeous vegetables that accompany a traditional steak, lamb shank, or fish dish? The bright green spinach, the orangest of carrots and bright green sugar snap peas and broccoli? Yep, they typically toss them into boiling salt water for a quick blanch, which seals in the color, and then immediately stop the cooking by immersing them in an ice bath. Well you can do the same thing with your fresh, fragrant basil and you get incredible, gorgeous pesto, just like you could get at a trattoria Italiano tipico. To cut corners (because that’s often the kind of gal that I am when I have two hungry kids tugging at my clothes), I use the boiling salted water in which I cook my pasta. 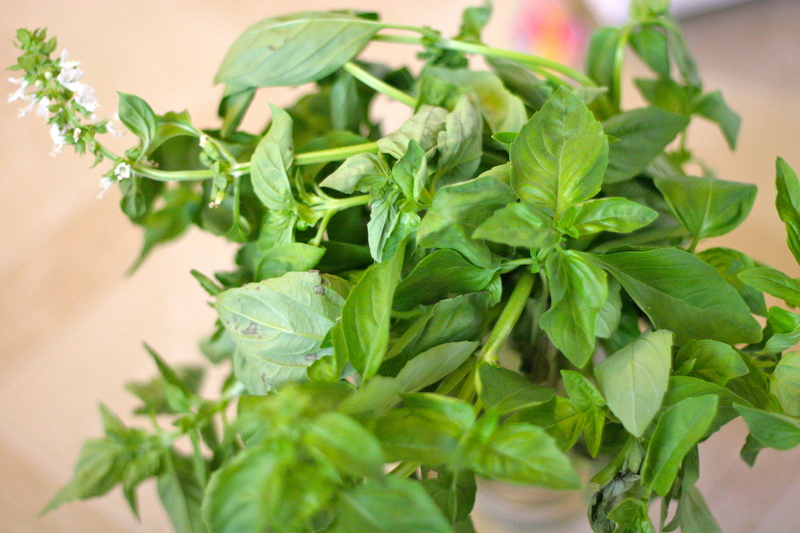 Simply toss in all your basil, if it is a small amount, or do it in batches with several bunches. Let it barely wilt, say 8 to 10 seconds and then fish it out with a strainer or one of those frying basket-spoons and plunge it into an ice bath for 20 or 30 seconds. Pat it dry on paper towels and then continue with your pesto recipe as planned. The lovely thing about this trick is that you can use less oil without worrying that the pesto is going to darken. As always, cover the extra bowls of pesto with a layer of olive oil and it will keep for a couple of weeks in the fridge or months in the freezer, especially if you made extra to give to sister number two who has just moved back to the Bay Area with her family. Hooray! 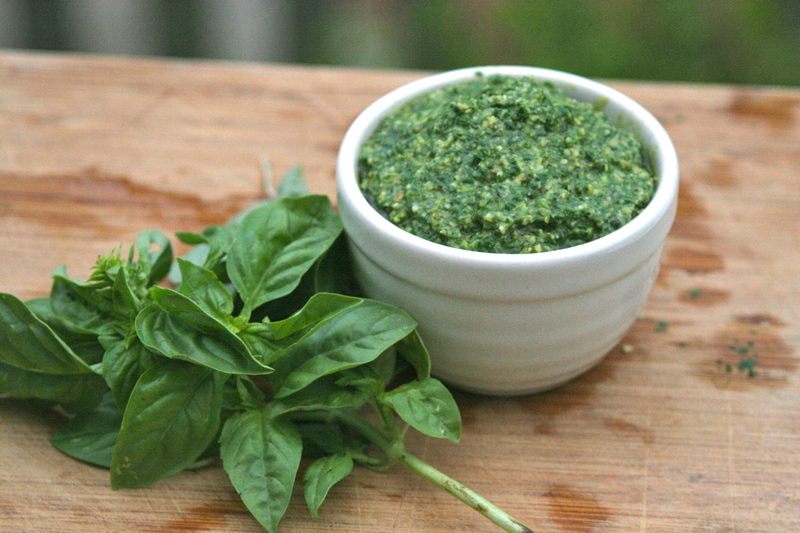 Note: A recipe for pesto is like giving a recipe for how much salt to add in something. It really depends on personal taste. This is my own favorite way of making it. Feel free to scale down the pine nuts or use raw ones, etc. Boil a huge pot of salted water (which you can use later if you are making pasta to go with the pesto). While it is heating prepare a large ice bath. In a Cuisenart, lightly whiz the pine nuts and garlic with some of the olive oil. When the salted water is boiling add the basil leaves in batches for only 8-10 seconds at a time. Remove immediately and plunge into the ice bath, swirling them around. Remove and drain of the excess water with either a salad spinner or by setting them in a colander or on paper towels. Repeat until all the basil has been blanched and patted dry. Add all the damp, blanched basil to the Cuisenart with the pine nut-garlic mixture and blend again on high-speed, slowly adding the rest of the olive oil and salt. Puree until the texture is to your liking. I like to leave a few larger bits of pine nuts so sometimes I add them in two batches. Taste for balance and add more salt if necessary. Store packed down into containers with a little layer of olive oil on top. If making a pasta right then, cook the pasta. When “al dente,” drain the pasta, reserving a half cup or so of the hot starchy pasta water. Return the pasta to the pot with generous helpings of the pesto sauce and add some of the pasta water, a tablespoon at a time while mixing. Serve with ample grated cheeses while the pasta is piping hot. This entry was posted in Dinner, Pasta, Vegan and tagged bright green pesto, how to keep pesto bright green, Real Italian pesto recipe, vibrant green pesto recipe. Bookmark the permalink. I honestly didn’t know basil pesto could be so brightly colored. I never thought about oxidation! I made some arugula pesto earlier this year and froze it—it was bright green when I made it but I suspect it has darkened since then. I’ll have to thaw some out to check! Yum, arugula pesto. What kind of nut/seed did you use? I have a few extra on my counter right now. Great tip. Will try and will let you know if it worked. Grazie mille! Thank you for sharing your recipe, will make some shortly! Outstanding tip — it works! Yay!!! I made this tonight and it tasted nearly as good as the pesto that we had in Tuscany and definitely better than anything I’ve ever bought in the store! How much is a bunch? I have twelve large Basil plants. I imagine I can make a lot of pesto. Just trimming two of the plants back, I have five or six loose cups of (just) leaves (after your blanching method). But, I am unsure of your basil measurement. How many cups of leaves is that? Thank you! Very helpful directions! Wow, I’d call that three bunches. I think of a bunch as one massive plant or about 10 branches. Good luck. 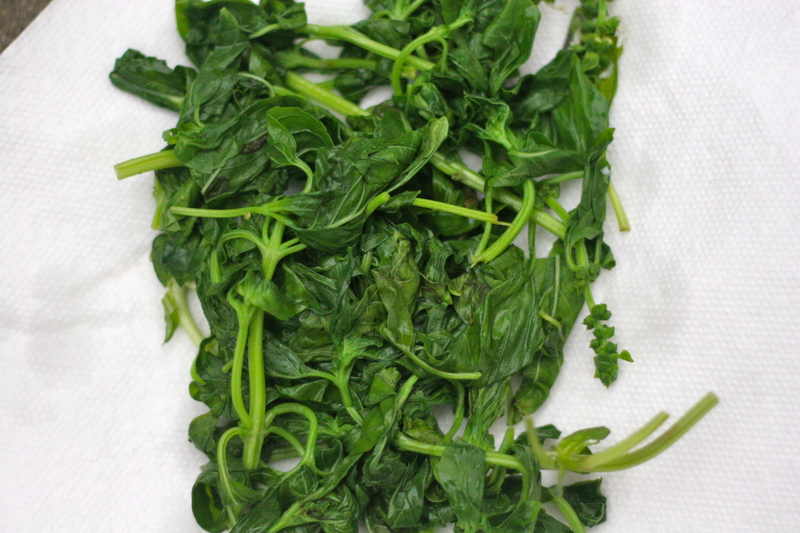 I chop off most of the leaves, but a few tender stems are ok.